Santa was extra nice to my family this Christmas. He convinced my husband to purchase me a separate laptop to keep all my business information on...which means TIME TO BLOG! So excited! It was so hard to do it on the computer we have everything we do on it. 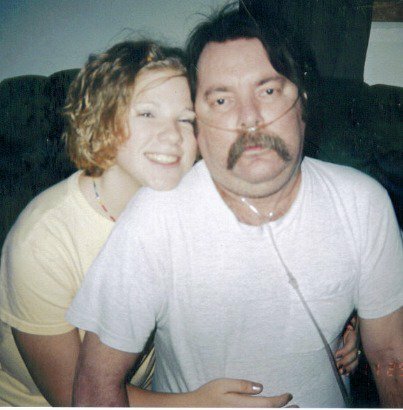 But the reason I decided to blog today, no craft or tip included, is that it has been 11 years since my wonderful father, Randy, passed away. He died of a genetic lung disorder, Alpha-One Antitrypson Deficiency. It was a courageous, long battle that fought. He passed the day after Christmas of 2000. He was so ill and only wanted to make it through Christmas. His goal was met, and he left the world peacefully. I was only 15. As many other children who lose their parent(s) at a young age, I didn't have him there at my high school or college graduation, at my wedding to give me away, there for the birth of my daughter and experience life as a grandparent. But, he taught me everything he could during our short time together. Life skills and lessons I will never forget and that I am going to pass on to my own daughter. I love you Dad. I know you are in a better place. Even though time is passing, there isn't a day that I don't think about you. Ever. No day passes without me looking at our last picture together. No matter how many years go by, that will never change. The only thing that will change is me. I have too many goals to accomplish in my life, and you taught me if I put my mind to it, I can do anything, and I will. Thank you Dad.